Richard Joseph Neutra is considered one of the world's most influential modern architects. His innovative and open designs express the freedom from conventions that many find in Southern California. He was born in Vienna, Austria in 1892 and died in Los Angeles in 1970. Neutra designed many distinguished public buildings, one being the Channel Heights Housing Project, a community development for shipyard workers in San Pedro, California (1942). The Channel Heights Housing Project is long gone. 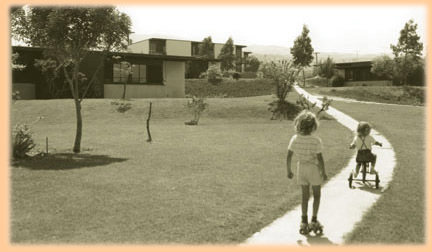 The buildiings and streets have been replaced by modern housing tracts. 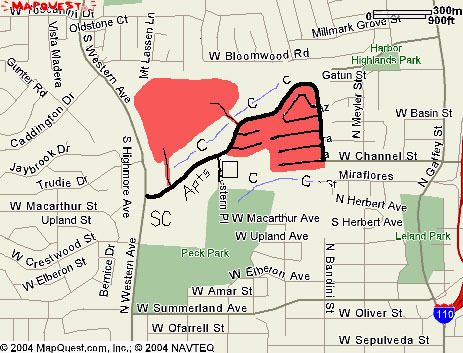 The red shaded area on this map shows their approximate former locations. where I've scrawled in Apts. 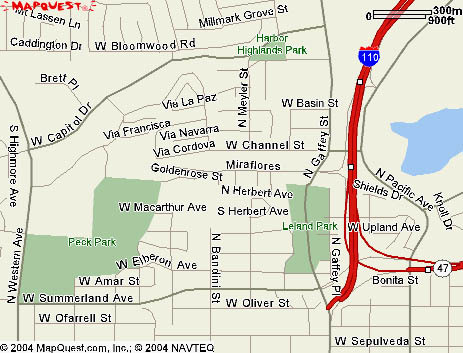 The dark line road is Park Western Drive. There were no C.H. apartments outside this line. The east side of the east leg had some other newer apartments. This is where we moved to when they tore down C.H. The blue lines and C's indicate canyon areas. These two had seasonal gullies down the bottom. I cropped Miraflores, as it did not go far then. A canyon was there. We called it "the horse canyon," as there were a couple of small private horse ranches down there. I've also cropped out Capitol Drive. This stopped closer to Meyler St. The portion of what is now Capitol was the deep canyon for a stretch, and then the northerly zone of Channel Heights. Harbor Highlands Park did not exist at first, but was built while I was there. The SC scrawl indicates the Shopping Center. This is a newer center which replaced an old shopping center. Off Park Western Place I added a square indicating Park Western Elementary School. I went to 5th & 6th grade there." This second map shows the area as it is today. 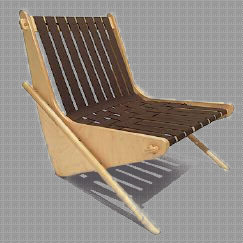 Neutra came up with the Boomerang chair for his low-income Channel Heights housing project in San Pedro. With angled sides that resembled the Australian throwing stick, the Boomerang was constructed of economical plastic strapping and plywood. Even with the cheaper materials, the design of it makes it more appealing than most modern office furniture. The historic design was upgraded and tweaked by son, architect Dion Neutra in collaboration with ODG design group and House Industries as a limited edition reissue.